15 years, 5 albums, and many singles after his debut release, Ubiquity is delighted to release a “best of” which includes previously unreleased materials, hard to find mixes, and the tracks which made Greyboy famous as the originator of a new laid back, sunny, jazz and soul-inflicted West Coast sound. 15 Years of West Coast Cool includes appearances from Sharon Jones, Quantic, AG (of Showbiz and AG), Bart Davenport (of Honeycut), Shawn Lee, Nino Moschella, Jeremy Ellis and others. 15 years, 5 albums, and many singles after his debut release, Ubiquity is delighted to release a "best of" which includes previously unreleased materials, hard to find mixes, and the tracks which made Greyboy famous as the originator of a new laid back, sunny, jazz and soul-inflicted West Coast sound. 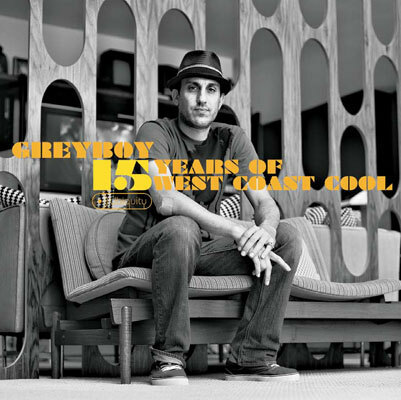 15 Years of West Coast Cool includes appearances from Sharon Jones, Quantic, AG (of Showbiz and AG), Bart Davenport (of Honeycut), Shawn Lee, Nino Moschella, Jeremy Ellis and others. Andreas Stevens, aka Greyboy, born 1970, was the first artist to sign to Ubiquity. Freestylin', his first full-length album, holds cult-status and is up-there with the label's all-time best sellers. Not bad for a record that cost less than $4000 to make, and sold on an advertising budget of $0! He was a man in the right place at the right time. While the acid jazz phenomenon was brewing in Europe in the early 1990s, Greyboy became the first American producer to mix instrumental hip-hop with jazz. His chunky beat-making sensibilities earned him praise from the European crowd, and his tracks were heard by crowds checking out DJs like UK-based Gilles Peterson, Marcus Wyatt (LA), and DJ Smash (NYC). "When I first started making beats, I was making hip-hop. Since I couldn't find MC's to work with, I decided to try the jazz thing and lace my tracks with live instruments instead. That's where Karl Denson and the Greyboy Allstars came into the picture", explains Greyboy. Beyond recognition from the DJ crowd, music by Greyboy also ended up in movies like Get Shorty and Celtic Pride, The Kelly Slater Surf Pro video game, Budweiser commercials, and he was picked to provide a mix CD for DC shoes. Since the release of Freestylin' he has released the equally jazz-based instrumental Land of the Lost and the soundtrack and hip hop inspired Mastered The Art, which featured musicians and MCs in a prelude to the vocal-heavy Soul Mosaic album. Greyboy has recorded with AG (Showbiz and AG), Sharon Jones, and the Greyboy All-Stars (whom he helped put together and produce). Over the years Greyboy has DJ'd in Japan, Europe, and across the USA. He has played to 5000 people in the countryside outside of Rome, and over 20,000 people a night on tour with Ben Harper and Jack Johnson.